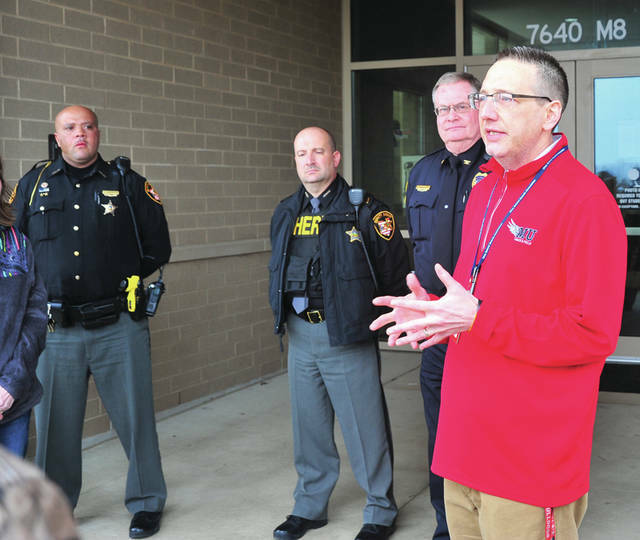 Mike Ullery | Miami Valley Today Milton-Union School superintendent Dr. Brad Ritchey, far right, addresses parents gathered at the entrance to Milton-Union High School as Friday’s lockdown was lifted. With Ritchey are Deputy Warren Edmonson, SRO for Milton-Union, Capt. Jamie McGlinch, SRO supervisor for Miami County, and Harry Busse, West Milton chief of police. WEST MILTON — Milton-Union schools were placed on lockdown Friday afternoon after the district received a suspicious phone call. A statement from Superintendent Brad Ritchey posted to the district’s website explained that the schools received what sounded like an automated call with a vague recorded message. He said that no specific threat was made. The lockdown was put into place around 12:30 p.m.
“We are taking every precaution in this situation, although the telephone call was non-specific,” he said. The district worked with the West Milton Police Department, Miami County sheriff’s deputies, and the schools’ safety officers to conduct a search of the campus, Ritchey said. Students were not released until their safety was assured. On social media, Ritchey said effort was made to allow students to use restrooms during the lockdown and that the district did its best to make sure all students ate lunch. “There has been no evidence of a credible threat or injury of any kind,” he tweeted. School officials and law enforcement officers announced the all-clear around 2:50 p.m. and school officials set about the task on getting everyone to their rooms for dismissal and begin the process of releasing students as school buses were allowed to enter. Ritchey addressed a group of parents gathered outside the high school entrance minutes after the lockdown was lifted. “There is no safety/security reason not to” hold school activities, he said. The final call on sports and events fell on the athletic director and those in charge of a scheduled music event. Chief Harry Busse of the West Milton Police Department said that when the call came in, School Resource Officer Deputy Warren Edmonson was on duty at the school. Busse, along with other officers from his department and Miami County deputies, responded immediately. Sheriff Dave Duchak emphasized that false threats not only tend to create concern for parents, students, and staff, but also are a serious draw-down on manpower to departments, keeping law enforcement officials from responding to actual emergencies. Duchak reiterated Busse’s comments that once the person who made the call is identified, they will face serious criminal charges. https://www.dailycall.com/wp-content/uploads/sites/30/2019/03/web1_032919mju_muhs_lockdown1.jpgMike Ullery | Miami Valley Today Milton-Union School superintendent Dr. Brad Ritchey, far right, addresses parents gathered at the entrance to Milton-Union High School as Friday’s lockdown was lifted. With Ritchey are Deputy Warren Edmonson, SRO for Milton-Union, Capt. Jamie McGlinch, SRO supervisor for Miami County, and Harry Busse, West Milton chief of police.